NSU College of Pharmacy continues to thrive and I am very proud to showcase our successes in our Winter 2017 newsletter. From amazing new hires to exciting new programs, the college is non-stop, with everyone working to ensure our students have access to unsurpassed opportunities. As examples, our new speaker’s series supports entrepreneurial dreams and opens our students’ minds to new possibilities. And the FPA Presidential Debate, hosted by our students, provided first-hand interaction with state leaders and exposure to issues affecting the pharmacy profession. Our students are actively engaged in advocacy and will be alumni who help transform the profession. Students at all sites continue to exhibit strong leadership and commitment to community. 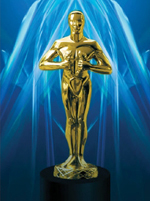 Congratulations to all of our faculty and students who have been recognized for their work! Sincere congratulations also to all of our college Stuey nominees! The College of Pharmacy is recognized university-wide for our excellence, commitment, and engagement and our amazing nominees have all contributed significantly to our success. I encourage all of our alumni to come back to visit and to all of our alumni who support our students, we thank you! The college is pleased to announce Rochelle S. Nappi, Ed.D., has been appointed assistant dean at the Palm Beach Campus. Dr. Nappi received her Ed.D. and M.S. from Nova Southeastern University, and her B.S. from Florida State University. She has been with the college since 2005 and served as director of student services, and assistant director of student services. Prior to 2005 she was assistant director of program development at the Orlando campus. Dr. Nappi’s commitment to student success, and the promotion of the Pharm.D. program, will continue to advance the initiatives, mission and vision of the college. 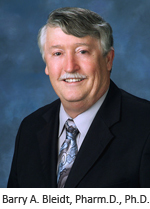 David P. Nau, Ph.D., R.Ph., FAPhA, will assume the position of assistant dean of accreditation and assessment. Dr. Nau received his Ph.D. from the University of Florida, a M.S. in Pharmaceutical Sciences from the University of Toledo, and his B.S.Pharm. from Ohio Northern University. 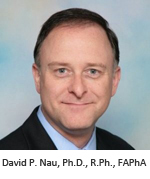 Dr. Nau was a faculty member with tenure at the University of Michigan and the University of Kentucky before joining the Pharmacy Quality Alliance where he was the Director of Practice Improvement, and the Senior Director, Research & Performance Measurement. He most recently was the president of Pharmacy Quality Solutions, Inc., an organization that served as the gold standard for measurement of pharmacy quality and a neutral intermediary for value-based contracts between health plans and pharmacies. Dr. Nau has published more than 50 journal articles and book chapters, given over 150 professional presentations and has been awarded numerous grants to study the quality of pharmacy practice. 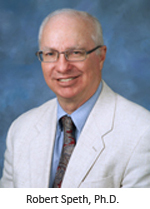 Dr. Nau brings to NSU his expertise as a pharmacy educator, researcher and executive, his commitment of service to the pharmacy community, and dedication to research and assessment. Internationally recognized Professor Albert Wertheimer, Ph.D., M.B.A., joined the College on the first of January. An expert in pharmacoencomics with experience in both industry and academia, Wertheimer will contribute his talents to teaching and research in health economics and outcomes research. 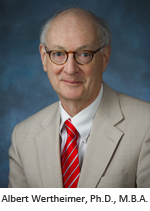 A pharmacist with a subsequent M.B.A., Ph.D. and a post-doctoral fellowship in the Social Medicine Department of St. Thomas” Hospital Medical School of the University of London, he is the author or editor of 40 books, many book chapters and the author or co-author of about 430 journal articles. In addition, he has consulted or lectured in nearly 80 countries and has directed about 90 Ph.D. students and many more Master’s degree students. Previously, with the University of Minnesota, Philadelphia College of Pharmacy, Merck and Company, Inc. and Temple University, he is pleased to be at NSU COP where he has found many very capable colleagues with whom he hopes to collaborate on future research endeavors. He and his wife live in Naples. 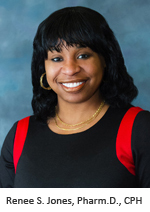 Renee S. Jones, Pharm.D., CPH, assistant director of pharmacy practice, was named the Director of Pharmacy Partnerships and Innovations. Jones, in collaboration with College of Pharmacy faculty, has been instrumental in developing partnerships between Accountable Care Organizations (ACOs) and the college with the college’s newest initiative ACO Research Network, Services and Education (ACORN SEED) which provides pharmacy-based research, services, and education to ACOs, patient centered medical homes, and management services organization. Jones previously served as the Director of Preceptor Development in the college recruiting, developing, and evaluating preceptors, and contributing to the on-going growth and development of the experiential program. We are pleased to announce the college’s nominees for the 18th Annual Student Life Achievement Awards, affectionately known as the “STUEYS”. Each year nominees represent some of NSU’s best in scholarship, leadership, involvement, service, commitment, integrity and inclusion. The celebration also acknowledges the hundreds of activities designed to enrich the overall student experience of the NSU community. 10 finalists per category will be selected from all nominees from the academic units within the university. On April 13, 2017 finalists will have a chance to win the STUEY trophy at the Rose and Alfred Miniaci Performing Arts Center. Congratulations to this unique group who contribute to our being a great college! Go Sharks! Executive of the Year: Blanca Ortiz, Pharm.D. Administrator of the Year: Jolanta Czerwinska, Ph.D.
Staff Person of the year: Kyle May, M.S. Professor of the Year: Devada Singh-Franco, Pharm.D. Co-Curricular Advisor of the Year: Dr. Alexandra Perez. Pharm.D., M.S. 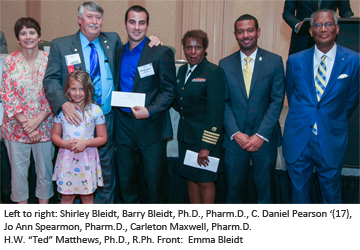 C. Daniel Pearson (’17) received the Barry A. Bleidt Scholarship Award at the SNPhA/NPhA annual meeting in Atlanta. The scholarship, in its eighth year, honors a SNPhA whose GPA is 3.0 or higher with demonstrated leadership. Pearson, past president of COP SGA, is currently the Region II Liaison for SNPhA. Presenting the scholarship was Barry Bleidt, Pharm.D., Ph.D., professor, social and behavioral pharmacy. 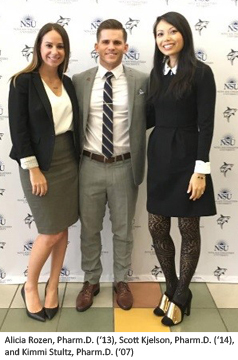 Three NSU COP students, Farima Raof (‘17’), Zejna Custovic (’17), and Damaal Walker (’18) were awarded scholarships from BCPA based on their academic success, community service, and advocacy for the profession. Awardees will be recognized at the May CE meeting on May 9, 2017. In addition, BCPA also donated $1000 towards transportation costs for COP students attending legislative days in Tallahassee, FL in March and an additional $1,000 to help with future fundraising efforts. Last year over 50 students attended Legislative Days and met with representatives and advocates for the profession. Mutasem Rawas-Qalaji, B.Pharm, Ph.D., associate professor of pharmaceutical sciences and director of the Center for Drug Discovery and Development (CD3) was the faculty keynote speaker at the 2017 Celebration of Excellence. The event showcases the university, its achievements within the community, and the President's vision for the university. 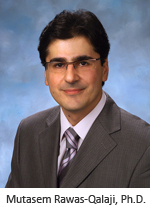 Dr. Qalaji recently submitted a patent for a new oral method for patients to receive epinephrine. The tablet will allow the drug to work quickly and more effectively. Read more and view video. COP faculty and Ph.D. candidate are featured (in order of appearance): Mutasem Rawas-Qalaji, Ph.D., Robert Speth, Ph.D., Ana Castejon, Ph.D., Appu Rathinavelu, Ph.D., Malav Trivedi, Ph.D., Ioana Popovic, Ph.D., Jean, Latimer, Ph.D., Jordan Spaw, Ph.Dc. Barry A. Bleidt, Pharm.D., Ph.D., professor of sociobehavioral and administrative pharmacy was inducted as an inaugural NPhA Fellow at the annual meeting in Atlanta. 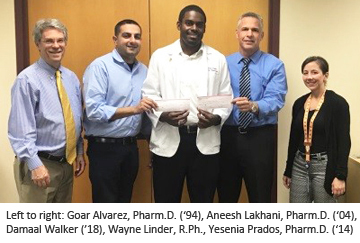 The Fellowship is awarded to pharmacists who have made substantial contributions to NPhA and have demonstrated exceptional service to the medically underserved. Congratulations Dr. Bleidt. Tuan Tong, Pharm.D. 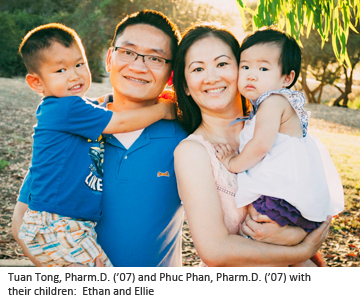 (’07) and Phuc Phan, Pharm.D. (’07) met on interview day in 2002. 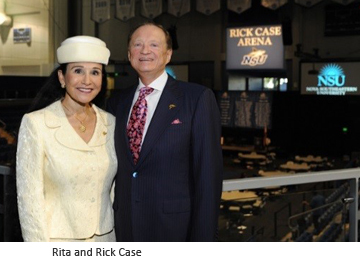 They didn’t know then that NSU would be a catalyst in their love story. Tuan came from Georgia for his interview and Phuc came from California. They would not meet again until orientation day in August 2003 and did not become a couple until their P3 year. Knowing he had met the love of his life, Tuan proposed on Valentine’s Day 2006 and on November 17, 2007 they were married. Now, 10 years later, they are the proud parents of two beautiful children, Ethan, 4, and Ellie, 2. “Thank you NSU for bringing us together as we would not have met – fate decided we should be at NSU and meet each other” says Phuc. Both Phuc and Tuan work for Publix Pharmacy - Publix 1079 and Publix1345 respectively, and are Advanced Community Pharmacy preceptors for NSU COP. Happy Valentine’s Day to our alumni couple. In January APhA-ASP and the Rho Chi Society hosted the Florida Pharmacy Association Presidential Debate. Alumna Angela Garcia, Pharm.D., M.P.H., CPh. (’08, ‘13) ran against William Napier, in her bid for FPA President-Elect. Dr. Garcia is currently assistant professor at University of South Florida College of Pharmacy and serves as FPA chair for both Public Affairs and Educational Affairs Councils. The debate was live streamed to colleges of pharmacy in the state and was an exciting opportunity for student pharmacists to experience the debate and the current issues facing pharmacists from pharmacy leaders first hand. The college initiated the first in the Leaders Rx Speakers Series in January. The purpose of the series is to engage students in opportunities within the pharmacy profession, share ideas, and encourage innovation and entrepreneurship. 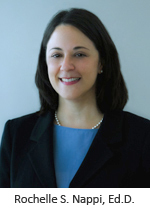 Guest speakers alumna Alicia Rozen, Pharm.D. (‘13) and Kimmi Stultz, Pharm.D. (‘07), (pictured here with Scott Kjelson, Pharm.D. (‘14), director of student transitions) engaged students in the hour-long session sharing their journeys from student to leader, the challenges and opportunities along the way, and finding their passion through hard work and ingenuity. Dr. Rozen is VP of Brand Development at Brand Institute in Miami, FL, and Dr. Stultz is CEO/Co-Founder of Juicery Rx a nutrition and wellness café in Parkland, FL. The series will continue throughout the year to provide opportunities for speakers and students to share ideas, innovations, and network. Alumnus Juan Santos, Pharm.D. 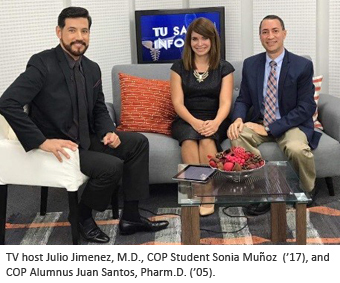 (’05) and P4 student Sonia Muñoz (’17) were guests on the Puerto Rico weekly TV show Tu Salud Informa. The show, hosted by Julio Jimenez, M.D., addresses health-related topics relevant to the general population. 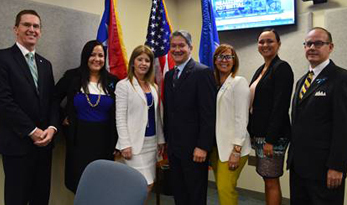 While on the show, Dr. Santos and Ms. Muñoz discussed medication safety from the pharmacist’s perspective. Ms. Muñoz, i s also a licensed medical technologist, has been invited back to discuss other health-related issues. The College of Pharmacy has made strides to further its global outreach and knowledge of international pharmacy programs by becoming a member of the International Pharmaceutical Federation (FIP). The Pharmabridge project, supported by International Pharmaceutical Federation (FIP), “aims to strengthen pharmacy education in developing and transitional countries through coordinated support from pharmacy establishments in developed and more advanced developing countries”*. The college, in partnership with the Pharmabridge program will host two Nigerian faculty members from University of Ilorin Teaching Hospital, in Spring 2018 for four weeks. During their visit, the Nigerian faculty will shadow the college’s faculty in the classroom, labs and at various experiential practice sites, including community pharmacies and hospitals, and will enjoy college and student hosted activities. We look forward to sharing our resources and knowledge to improve pharmacy practice and teaching methodology in the developing parts of the world. For more information visit the International Pharmaceutical Federation (FIP) website.